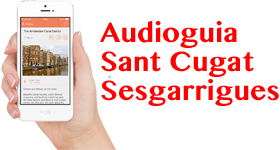 Sant Cugat Sesgarrigues is located in the depression of the central Penedès and with an extension of 6,24 square kilometers is home to a few thousand people. Among the items to highlight of Sant Cugat there are historic buildings, as the Church, and several farmhouses, some more than trees. As a people of the Penedès, the environment, eminently agricultural, the vineyard and the elaboration of wine and cava, they are also an essential part of this town, as evidenced by the fact that a bunch of grapes the coat of arms of the municipality. Here you will find the shops of Sant Cugat. If you want to eat something in Sant Cugat, You can do so here. In Sant Cugat, you can enjoy different routes and excursions. Envoltat de natura, Sant Cugat ofereix un ampli ventall de rutes d’innegable interés paisatgístic. A Sant Cugat disposeu d&#8217;un servei d&#8217;informació turística al servei dels visitants. 40a Trobada de caramelles de l’Alt i Baix Penedès, Garraf, Anoia, Baix Llobregat i Baix Camp. Es farà el diumenge 28 d&#8217;abril a la pista poliesportiva a partir de les 10.00h, moment en el qual es donarà la benvinguda i començaran les actuacions de les 23 corals convidades.